Home » Coast to coast » Justice for Freddie Grey! Baltimore FIST says No to police terror! 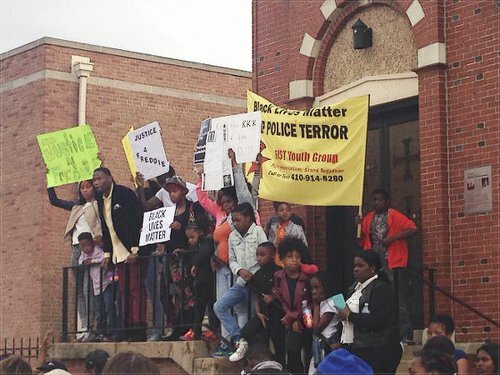 Hundreds protest on April 21 in the neighborhood where Freddie Grey was killed by police. The following statement on the police killing of Freddie Grey was issued April 21 by Baltimore FIST — Fight Imperialism, Stand Together — a revolutionary youth group dedicated to fighting police terror and capitalism. On April 12, a 25-year-old Black man was harassed and eventually killed by the Baltimore City Police Department. His name was Freddie Grey, and although the exact details of his death remain unclear, what happened to him is no mystery. The circumstances surrounding his death are especially appalling and illustrate the brutal, racist nature of the police under capitalism. Cell phone video from a nearby witness clearly shows Grey laying on the sidewalk, screaming in pain while three police officers drag him to his feet and into a police van. The woman recording the video is heard exclaiming that Grey’s leg looks broken. In addition, his head is hanging, not in a natural position. The police show no concern for his well-being, and it has been reported that he was additionally restrained inside the van. After Grey was in the van, there are conflicting accounts of what happened next. Originally it was claimed that he was taken to the Western District police station before an ambulance was called for him. Later, the police claimed that they took him straight to a hospital. Regardless of the exact timeline of events, Grey’s lawyer reported that by the time Grey was in the hospital, three of his vertebrae were broken and his spine was 80 percent severed. The Baltimore Police Department inflicted these obscene wounds, which caused Grey to fall into a coma soon after the incident. On April 19, Freddie Grey was dead. On the day before he died, protests were held at the Western District police station to demand accountability for what at the time was a case of brutal police assault but not yet murder. Grey’s death on April 19 only raised the level of anger in the community, and hundreds of people took to the streets of Baltimore to protest yet another death at the hands of the police. 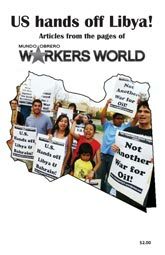 Since then, protests have not stopped, and they are expected to continue. Grey’s murder represents another case in a long line of racist police terror and occupation in Baltimore City and beyond. The police in the United States trace their roots directly to the era of slavery. The ancestors of police departments were the men who would hunt down enslaved Black people who had escaped to freedom and return them to brutal exploitation. The modern police forces that exist now came about with the development of capitalism and have existed solely as a means of oppression. At all points, they have been an instrument of class rule, used by the exploiters to repress workers and oppressed peoples. We in FIST stand firmly in solidarity with Freddie Grey and all victims of police brutality. In Baltimore, FIST will be in the streets fighting for justice for Freddie Grey and demanding that the murderers who killed him be brought to justice. In conjunction with other groups, we are also raising the demand that the police be placed under direct, democratic community control as a first step toward their eventual disarmament and abolition. Black lives matter! End police terror! Justice for Freddie Grey!